In March 2016, Ricoh released a new digital monochrome multifunction printer (MFP) to the world. It is the "RICOH MP 305+." Although compact in size with a width of only 350-mm, it can handle A3 paper and operates quietly without bothering you even if placed at your deskside. How was an MFP of such distinguished performance and design from the traditional products born? Let’s have some witnesses explain. Why don't we first forget MFP common sense? "We have created it, with all the people involved concentrating their wisdom, while exhibiting 120% of power and, and exerting love. I think this is a product that could have been developed by no one but Ricoh." "I made many creations that adhered not only to appearance but also to details, including operational issues. I hope you can see what we've done." "I am sure that once you use it, you will realize its merits, such as size and silence, and that you surely will come to love it." 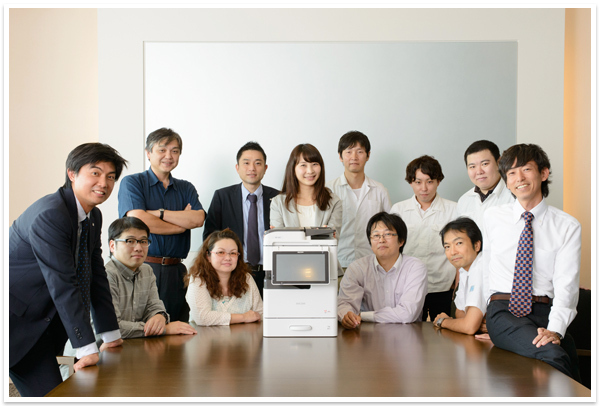 In the background surrounding the birth of the RICOH MP 305+, there were wishes of people engaged in creating products at Ricoh over the years. Kazuhiro Yamada, who took charge of product planning, is one of them. He joined Ricoh in 2001, and while roaming about sections, such as domestic sales, business strategy, product planning, and a foreign posting, he has continued wondering if Ricoh products are appreciated by the customer? What differs from products of other companies?" Don't they believe that "Copying, scanning, and facsimile functions will suffice for the time being? All MFPs are the same? It is disappointing if that is true." A chance to achieve such wishes of Yamada, to create products that are appreciated by customers and excite them are here at last. The project for developing RICOH MP 305+ started. That was April 2012. Couldn't we build an MFP that excites customers? That was also a wish of Shuuichi Takeda, a product designer. For ten years after joining the company (in 2012), he has dealt with many exterior package designs and thought of the right design as a largest-common-divisor MFP, disliked by nobody as a public property, which everyone can use as is. On the other hand, he also considered the potential for MFP design supported emotionally by the customer, breaking down the established concept. For him, participation in the development project of the RICOH MP 305+ served as an excellent chance, and henceforth he continued shouldering the role of putting members' wishes in a form suited to customers. “An MFP unavailable until now? A feeling of excitement?" Kohichi Fujimori, who participated in the development as a project manager (PM), was surprised to discover the enthusiasm of the staff in charge of product planning and designing. "There are people with such leading-edge ideas in the same company. "He joined the company in 1991 and has worked since then in the business sector of facsimiles and recycling. The fact that he had abundant experience in fields other than MFPs may possibly have affected the birth of the "heterodox" MFP, which is the RICOH MP 305+. However, Fujimori reveals, looking back upon himself at that time saying, "There was a difference in temperature with the staff in charge of product planning and design." He wondered if "we can truly create a product to impart a feeling of excitement?" However, while deepening the argument with the members for building up a concept, something asleep within him woke up. "Am I trying merely to settle on something safe? OK! Let's try! "Let’s dare to adventure!" It was these innovators who made it possible to create products that impart a feeling of excitement with customers. Stick to slim and compact (Members' heat moves a project). Several months after the project started, the basic concept of the RICOH MP 305+ was completed. "MFPs you feel intrinsically close to you." It should not only be something comfortable placed at your deskside, but something you'd really like to have nearby. For that purpose, you have to make it thoroughly compact. This was also supported by the survey implemented by a member of planning that targets global customers. As a result, the 350 mm width was derived. Yamada declares "This line cannot be conceded." The size of all conventional MFPs (A4 monochrome machine) was always at least 400 mm. I was sure that the customers would surely welcome a product (*) smaller than that, which can also handle A3. In response, many designers, including those from outside the company, prepared tens of design proposals with the concept term "refined design," posted them on the wall, and repeated in arguments among the project members. The days wrapped in heat to create a better product continued, discussing such things as "that's too much leading-edge," or “this at a minimum is necessary to overturn the status quo," and "whether it matches an office." *A product that can also handle A3: Ricoh thoroughly investigated A3 model customers, on their use status: it turned out that there is a considerable number of customers where the frequency of A3 output is low. The plan of the "MFP is to handle A4 for the most part, and to handle A3 only when required" was born there. "I was able to put the noise reduction technology in the element development to practical use. I reduced the noise of an MFP so that it could be comfortably used by the customer even where it wouldn’t have fit in the past." "I paid ever increasing attention to details this time, in development. I believe I was able to meet planners’ requests for the most part. I was able to send products to the market with confidence." Takayuki Nishi, in charge of structural design of main-body. "There were many restraints and also a chain of difficulties. Consequently, my sense of achievement was great and I am pleased, from the bottom of my heart, that I could engage in development. I received precious experience." "Although it was a repeating cycle of trial and error, I think this experience will form the basis of future design activities. I feel I was able to achieve well-rounded growth." "Now, what should I do?" Nobuhiro Shima, the machine model leader of main-body mechanism got a headache when he learned the product’s specifications. To achieve a width of 350 mm, depth of 460 mm, and height of 505 mm, and beyond that, to make it possible for A3 paper to pass through, you have to transport A4 widthwise. With this, as best one can, an imaging unit (a device comprising photo conductor, developer, etc. 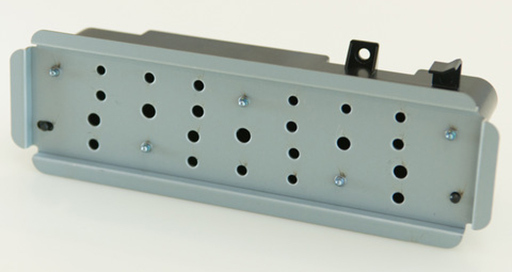 together) and a drive unit (a device comprising components for moving rollers etc.) can be arranged in sequence, but the electrical unit cannot be co-located (a device assembling electrical-system components together). Shima, who was an expert in design with 22 years’ experience (in 2012), groaned. Collocation of the imaging system and drive system cannot be changed. The only way is to move the electrical unit, which was arranged at the back side thus far, in the upper position. Shima thought that this radical layout alteration revealed the prospect of compact design to cross-feed A4. Moreover, I expected the size requirement to be met by down-sizing the drive system. Takayuki Nishi, the person in charge of main-body structural design, marveled at seeing a layout chart. "Can it be done safely?" The reason was in the corner radius (radius of the rounded corner) of the main body requested by the design. While feeling it difficult to achieve even the requested compact size, further requests came to round off the four corners. It was his fourth year (in 2013) after joining the company, and he had been engaged in designing main body drives of digital printers, but the requested corner radius was one he had never seen. As large as the exterior radius is, the frame size becomes small and the margin of unit disposition is lost. Although it was a difficult request, he was able to create beautiful roundness, not provided in conventional MFPs, by exercising originality and creativity. In addition, we decided to extend the depth also by 10 mm from initial planning. Nishi says, "I wanted to respond to the requirement of the design by all means to make the backplane flat." Nevertheless, we were far from leaving "margin” and 0.1mm unit continued further. The MFP, even compact, to allow A3 paper pass is borne by such designers' efforts. Katsuhiro Hoshi, who took charge of the air current design, faced similar troubles by the strain of downsizing. His mission was to promote optimization of ventilation or exhaust for countermeasures against heat inside main body. 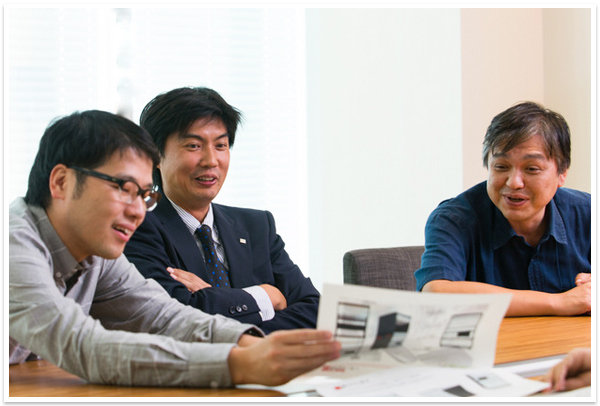 Hoshi, who joined the company in 2010, had dealt with the air current design of high-speed machines until then. Unlike the case with high-speed machines, where some room inside is comparatively available and, moreover, allows disposition of many fans, the space was restricted this time, and also the subject of noise reduction put additional pressure on him. Hoshi thought, "I was given an outrageous theme." Because the inter-module gap was close, the duct shape was restricted, and also a severe restriction was imposed that no louvers (fins for controlling air current) are allowed on planes other than the backplane, giving priority to the design. Moreover, he was requested to suppress the number of fans to the minimum and to lower the number of revolutions to reduce noise. Hoshi challenged these difficult questions, repeating simulations every day. He invented unconventional methods one after another, such as incorporating a sensor for temperature detection, in order to eliminate an unnecessary rotation of fans, or providing a pneumatic heat insulating layer in the fusing unit, which is the greatest heat source. In this way, he achieved compatibility of noise reduction and temperature rise, without sacrificing miniaturization and the nature of design. While the structural design team continued trial and error in a 0.1mm unit, the noise reduction technology team was promoting the match in a unit of 0.1dB(A) . The targeted value was 57dB(A). This was the goal the noise reduction technology team set for themselves. "Because a conventional deskside machine emits around 63dB(A), we shall reduce noise overwhelmingly. Otherwise, there is no sense in continuing." Noise falls by one-half every -3dB(A). Numeration shows reduction of about 75% by -6dB(A), about 88% by -9dB(A). They made full use of many new noise reduction technologies, such as making gaps between sheath covers into maze shape (labyrinth structure) to reduce noise leakage, besides making a refreshing change (internally-toothed gear (*)) of the drive gear mesh system, which is the main source of noise. Although this much could suppress by half the conventional figure, they could not move ahead from there. Ishida expressed "the wall of 60dB(A)." The primary factor was in paper transportation noise. * Internally-toothed gear: A gear with tooth provided inside the circumference. The noise of biting teeth decreases compared with the externally-toothed gear. The new world spread out beyond the wall (no more problems with space to install). Ishida adopts a radical measure to break through the wall of 60dB(A). He decided to mount a Helmholtz muffler (*), which was under element development, near the paper ejection tray. There were two important points in mounting it. Design to obtain muffling performance responding to the source of noise, and to make the structure simple to suppress cost. They repeated measurement and prototyping repeatedly and designed the muffler proportionate to the frequency of noise. And they finished it in a simple structure combining sheet metal with a mold. In doing this, they were able to go lower than 60dB(A), and further achieved the goal of 57dB(A) by reducing transport noise and fan noise. Eventually, they achieved overwhelming noise reduction at 56.4dB(A), and of 52.7dB(A) in silent mode. In this way, an MFP, which can be used without constraint in quiet and calm places, for example, a library, was born. * Helmholtz muffler: A sound-muffling technology generating resonance phenomena called "Helmholtz resonance"
"Because it is a very characteristic product, I would like to explain the charm of the product to all sales channels carefully and strive for their empathy." Miki Yamada, in charge of overseas marketing. "Taking a glance at the product, I found it differs from the old MFP. I was sure that customers would be interested. I would like to deploy marketing, without forgetting the fresh excitement at that time." 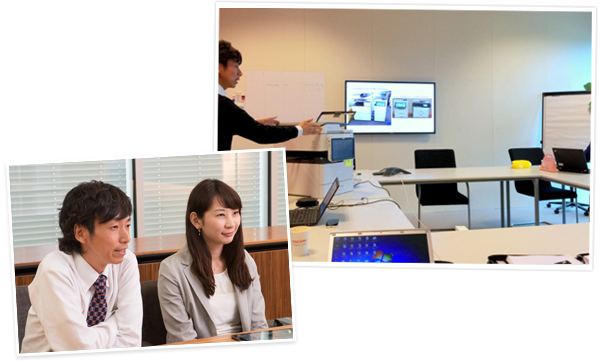 Jun Ueno, who was assigned at the Ricoh Europe branch as the person in charge of overseas marketing in February 2014 saw the members of product planning and marketing when they visited from Japan. Their purpose was to investigate the overseas MFP market. The members went around to visit the customer's offices and dealers etc. to conduct thorough hearings. That had to be harnessed in development of RICOH MP 305+ later. Then, in December 2014, Ueno came back to Japan and became the overseas marketing leader of RICOH MP 305+. Ueno reveals that "when I first learned the outline of the product, I was perplexed for a moment because it differed too much from a conventional MFP." However, while taking the opportunity to touch a real machine after that, he came to consider that the "difference" itself was a "strong point." "The fact that there are no MFPs like RICOH MP 305+ in other companies it means that we can appeal to customers with a different competition rule. It may be interesting." Ueno was suddenly highly motivated. This will let our customers turn to us. (The person in charge of overseas marketing fell in love at first sight). “Wow! I have never seen such an MFP." It was love at first sight. In addition, because the Smart Operation Panel is mounted on the overseas machines, I can propose solutions, which goes beyond merely supplying MFPs. Yamada felt that it will become a powerful item to promote products + services. It was just the product she was waiting for; she likes to challenge new things. “This can let our customers turn around to us and I will surely let them turn around." The overseas marketing group has established the concept "Intelligent Slim," towards overseas sales of the RICOH MP 305+. Intelligent expresses A3 and Smart Operation Panel, and Slim expresses Compact and Silent. 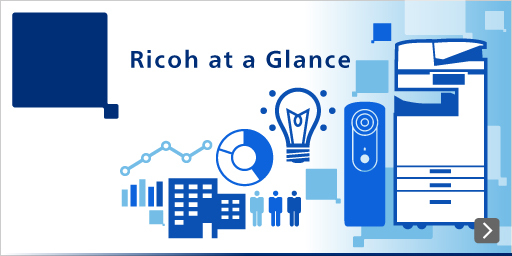 Yamada’s eyes sparkle when she says "I would like to convey this product concept summarized as “Intelligent Slim” to every corner of the earth, so that customers around the world can feel the RICOH Difference." In March 2016, global sales of RICOH MP 305+ started. Our wish to create an MFP not available until then now reaches our customers at last after three years of development. 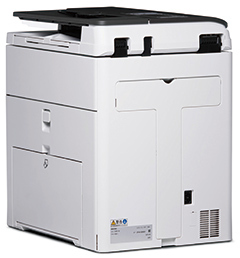 Henceforth, we would like to increase Ricoh fans further by our customers' use of this MFP around the world. The members' wishes extend further. 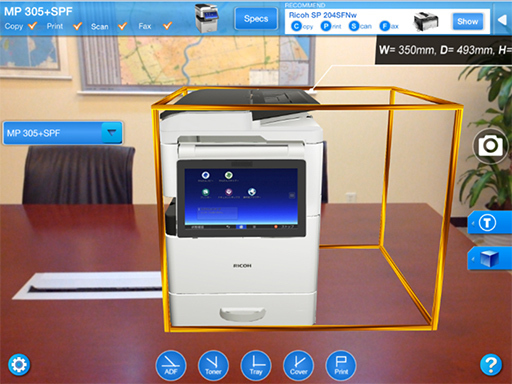 Ricoh provides the application "RICOH AR" for smart devices at no charge, which displays in virtual 3D the installation image of MFPs or printers. 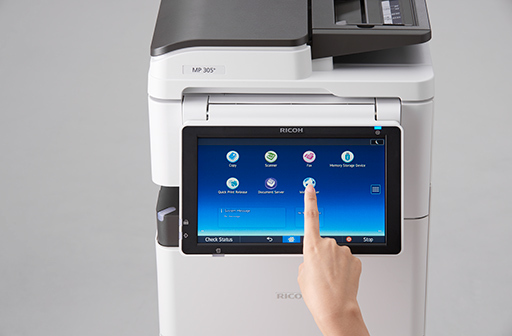 It can reproduce the installation image of the RICOH MP 305+, printing image, opening-and-closing images of each cover and ARDF (Automatic Document Feeder).